Amazing! My face feels so soft after using Brightening Facial Scrub Argan Stem Cell + Chlorella by Acure Organics and the fresh look lasts. Once a week is enough. Brightening Facial Scrub Sea Kelp by Acure Organics smells so good, and doesn't dry out your skin like a lot of other scrubs. You just feel really clean. Highly recommended. Brightening Facial Scrub Sea Kelp by Acure Organics cleanses gently, no harsh chemicals easy on the skin. 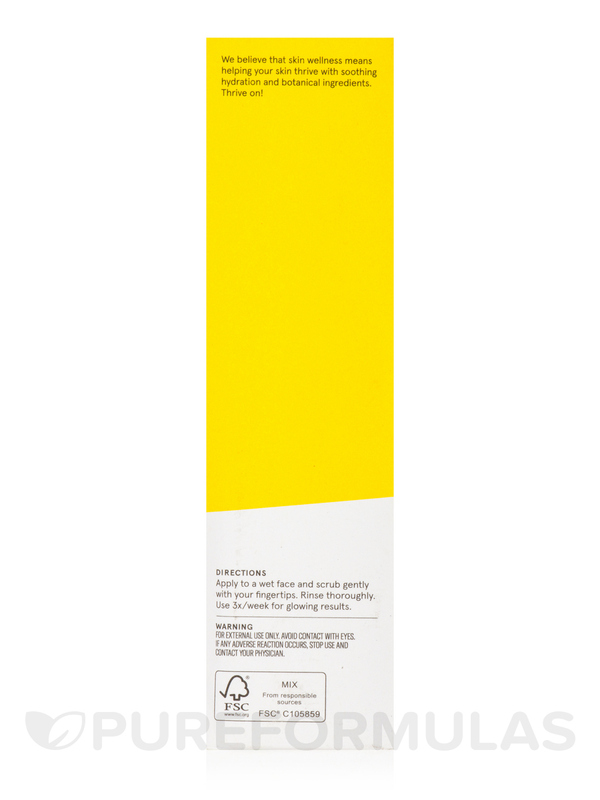 Brightens without all the chemicals a little goes a long way. Great value. Sea kelp & French green clay‚ all skin types. Water/Aqua‚ aloe barbadensis leaf juice‚ glycerin‚ sodium methyl cocoyl taurate‚ juglans regia (walnut) shell powder‚ kaolin (french green clay)‚ sodium lauroamphoacetate‚ citrus limon (lemon) peel‚ sodium pca‚ sodium lauroyl lactylate‚ glyceryl laurate‚ sodium cocoyl isethionate‚ olea europaea (olive) fruit oil‚ laminaria digitata (kelp) powder‚ lilium candidum leaf (madonna) leaf culture extract‚ euterpe oleracea (acai) fruit extract‚ rubus fruticosus (blackberry) fruit extract‚ rosa canina fruit extract‚ punica granatum extract‚ calendula officinalis flower extract‚ chamomilla recutita (matricaria) flower extract‚ asphalatus linearis (rooibos) leaf extract‚ chlorophyl‚ chrondus crispus extract‚ argania spinosa callus culture extract‚ chlorella vulgaris extract‚ helianthus annuus (sunflower) seed oil‚ cymbopogon flexuosus (lemongrass) leaf oil‚ mentha virdis (spearmint) leaf oil‚ salvia sclarea (clary sage) oil‚ lavandula hybrida (lavandin) oil‚ cellulose gum‚ sodium levulinate‚ glucono-delta lactone‚ potassium sorbate. 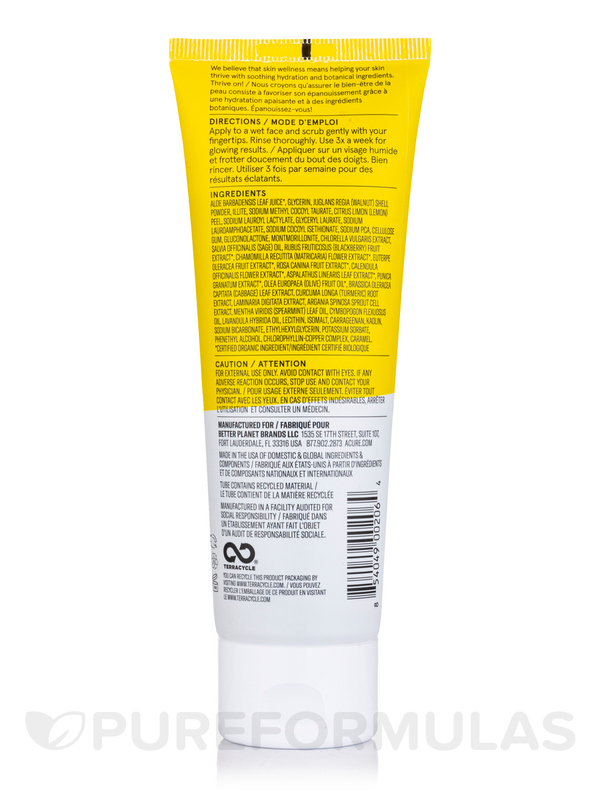 Paraben free‚ Sulfate free‚ Mineral oil free‚ Petrolatum free‚ Silicone free‚ Cruelty-Free. If any adverse reactions occurs‚ stop use and contact your physician. Brightening Facial Scrub Argan Stem Cell + Chlorella by Acure Organics is great to use once or twice a week. Awesome exfoliator! I absolutely adore this face scrub. Brightening Facial Scrub Sea Kelp + CGF by Acure Organics makes my skin feel so smooth and clean without drying it out one bit. I've been using it for about two years now and don't plan on stopping anytime soon. Gentle exfoliation, does what it says. Wish I could buy a bigger tube! I used Brightening Facial Scrub Sea Kelp + CGF by Acure Organics on my face when I took a shower, it's good stuff. It worked well. Easy to keep in the shower. Messy green grit in the shower. I like the way Brightening Facial Scrub Sea Kelp + CGF by Acure Organics scrub feels and smells. 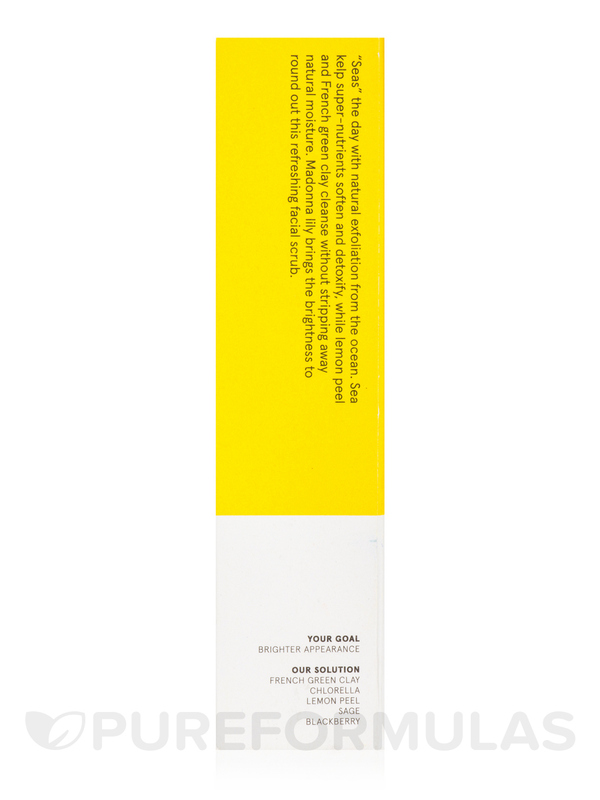 It seems very effective in removing dead skin cells and resurfacing your overall complexion. It's fairly rough as a scrub so keep that in mind, it is not a gentle scrub. This one made the cut. 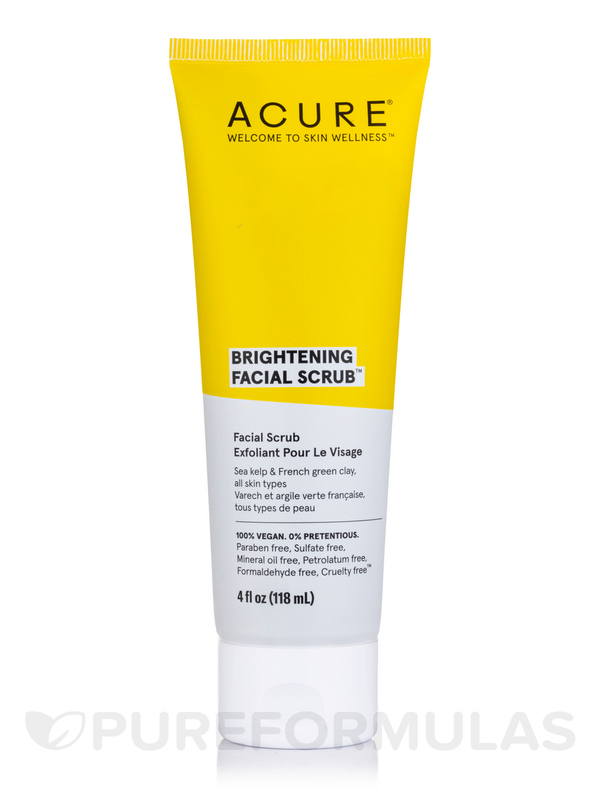 I will add Brightening Facial Scrub Sea Kelp by Acure Organics to my scrub collection. The only scrub I use to use was St. Ives until they changed something about it and it's snot as "scrubby" anymore. 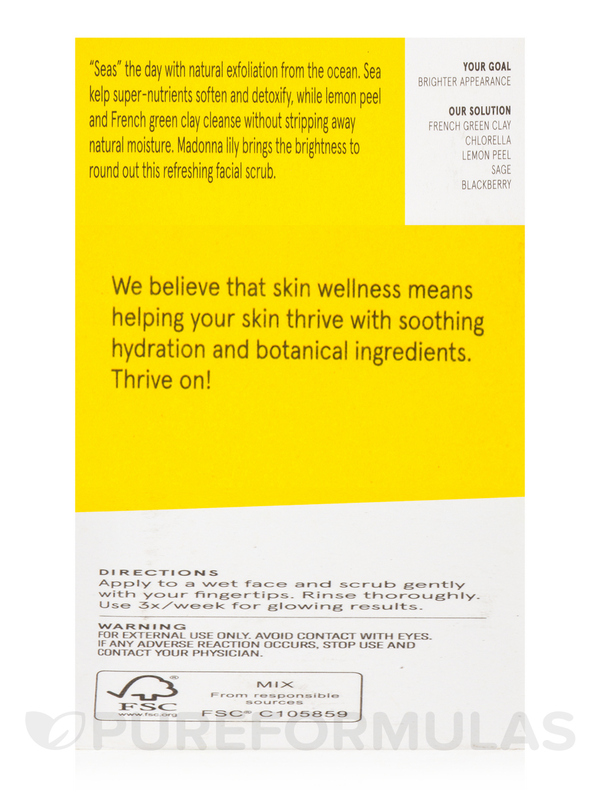 I like t his one because I feel like I'm exfoliating my skin and my skin is brighter after a couple of uses. Good product, but I like others better. Brightening Facial Scrub Sea Kelp by Acure Organics did a good job, but I prefer St. Ives apricot scrub for my skin. 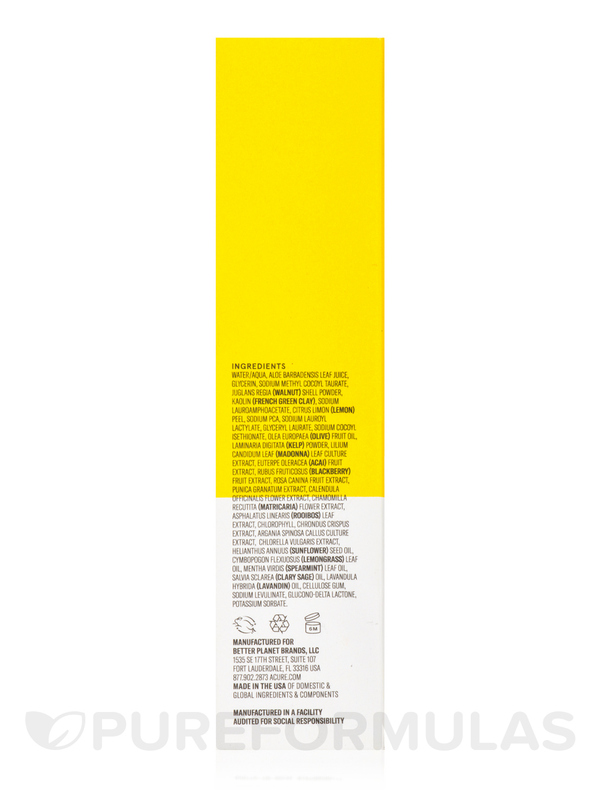 I have very sensitive skin and this product was just not right for me. The first scrub I LOVE. I've been looking for a great facial scrub for a LONG time. 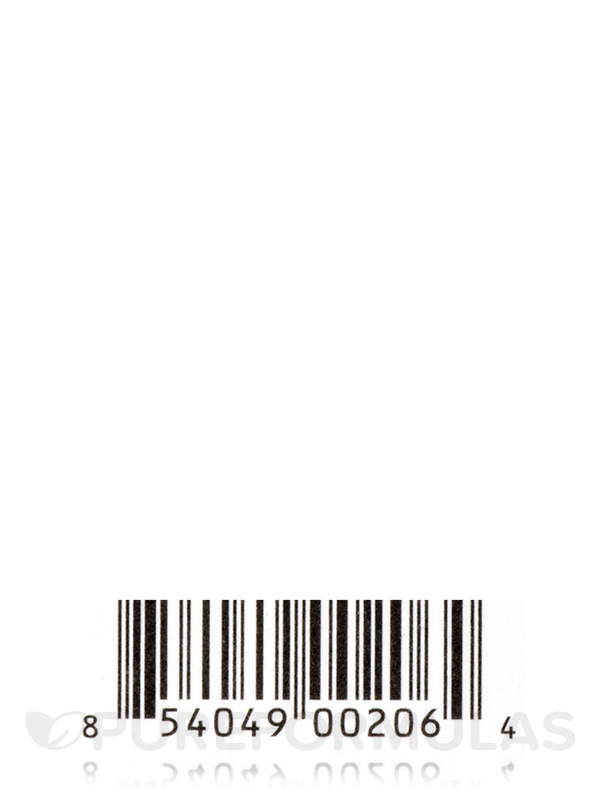 I've tried everything from typical drugstore brands to all natural/organic brands. I never found something worth purchasing twice. Many were ineffective and could hardly be described as "scrubs," while others broke out my sensitive skin (exactly the opposite of the effect I'm looking for!). I've been using baking soda, which is inexpensive, but messy and inconvenient at times. After trying Brightening Facial Scrub Sea Kelp by Acure Organics, I can't believe how much I love it! First of all, it does the job (no sparse "microbeads" that don't actually exfoliate). My skin feels velvety smooth after and looks fantastic, and you really only have to use it three times a week as per the instructions. My skin tone is much more even, and I've only used it a few times. I notice my makeup looks much more flawless than it did before (but, hey, with how great my skin looks, I might be able to use less makeup now!). Plus, you only have to use a bit of product, which makes the higher price tag worth it for these results. Very fine grit. 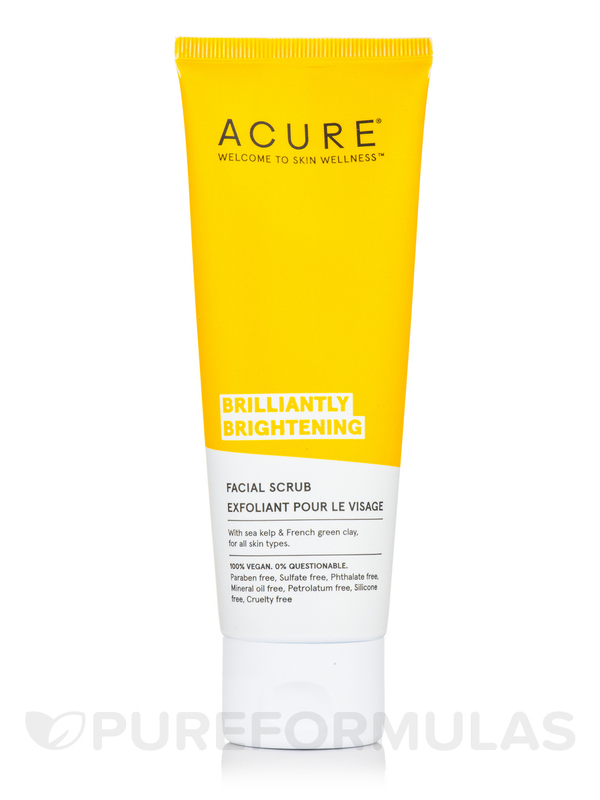 Brighteing Facial Scrub Sea Kelp by Acure Organics cleans thoroughly and I can tell it is brightening my skin. I like the fine grain and natural ingredients. A little goes a long way. The smell is different but not too bad. Can this product irritate skin with rosacea? Hi Sally, thank you for choosing Pureformulas.com. 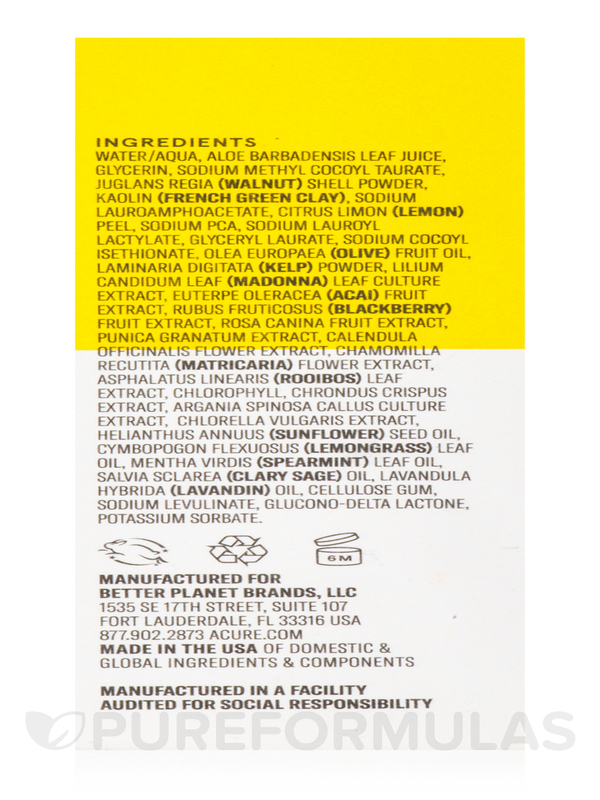 We do apologize but we cannot tell whether this product can irritate skin with Rosacea due to the fact that we are a distribution center and not the manufacturer. 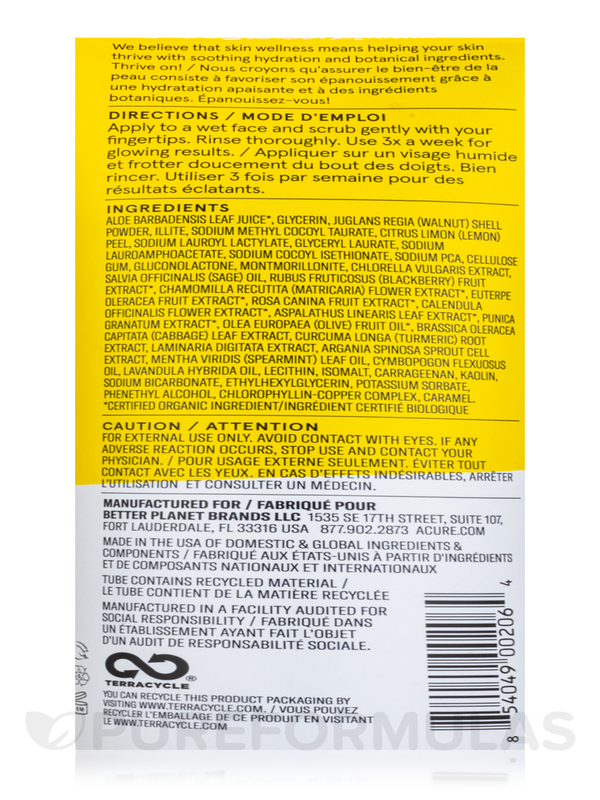 You would have to contact your health care practitioner to know if this product is safe for skin with Rosacea.